Simon & Schuster, 9781476794891, 384pp. 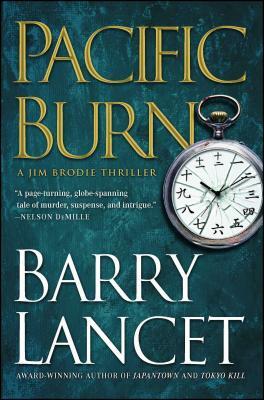 Japanese antiques dealer and PI Jim Brodie goes up against a killer operating on both sides of the Pacific in Barry Lancet’s Pacific Burn—“a page-turning, globe-spanning tale of murder, suspense, and intrigue that grabs and holds your attention from beginning to end” (Nelson DeMille). In recognition for his role in solving the Japantown murders in San Francisco, antiques dealer and sometime-PI Jim Brodie has just been brought on as the liaison for the mayor’s new Pacific Rim Friendship Program. Brodie in turn recruits his friend, the renowned Japanese artist Ken Nobuki, and after a promising meeting with city officials and a picture-perfect photo op, Brodie and Nobuki leave City Hall for a waiting limo. But as soon as they exit the building, a sniper attacks them from the roof of the Asian Art Museum. Brodie soon realizes that, with the suspicious and untimely death of Nobuki’s oldest son a week earlier in Napa Valley, someone may be targeting his friend’s family—and killing them off one by one. Suspects are nearly too numerous to name—and could be in the United States or anywhere along the Pacific Rim. The quest for answers takes Brodie from his beloved San Francisco to Washington, DC, in a confrontation with the DHS, the CIA, and the FBI; then on to Tokyo, Kyoto, and beyond, in search of what his Japanese sources tell him is a legendary killer in both senses of the word—said to be more rumor than real, but deadlier than anything else they’ve ever encountered if the whispers are true. In the third book in “what will likely be a long and successful series” (San Francisco Magazine), Barry Lancet delivers his most exciting Jim Brodie novel yet. Barry Lancet is a Barry Award­–winning author and finalist for the Shamus Award. He has lived in Japan for more than twenty-five years. His former position as an editor at one of the nation’s largest publishers gave him access to the inner circles in traditional and business fields most outsiders are never granted, and an insider’s view that informs his writing. He is the author of the Jim Brodie series: The Spy Across the Table; Pacific Burn; Tokyo Kill; and Japantown, which received four citations for Best First Novel and has been optioned by J.J. Abrams’s Bad Robot Productions, in association with Warner Brothers. Visit Lancet at BarryLancet.com or on Twitter @BarryLancet.